We will arrange to visit your property to carry out a landlord gas safety inspection. As well as issuing a Landlord Gas Safety Certificate our gas safety inspections usually include a boiler service unless stated otherwise. We will inform you of any urgent issues when we are on site so that we can fix the problem as soon as possible. 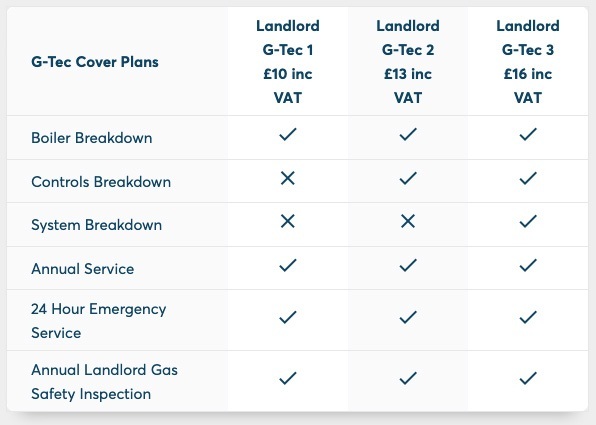 Look at our landlord gas maintenance G-Tec plan; it’s the best value plan available. A normal landlord gas safety inspection check is £75 inc VAT. Our landlord G-Tec cover plans will provide your tenanted property with the same level of care we take with our personal customers. You will, of course, be informed of any work that is required before it’s carried out. Why use our G-Tec plan? Our G-Tec Landlord gas maintenance plans are the best deal you can get. We have no hidden charges, no excess, no hidden labour or parts costs. We will give you a prompt, polite, honest service and value our reputation. *Please note: prices may vary depending on size, age and condition of boiler and system. Please refer to our Terms and Conditions. All prices are per calendar month. Prices include VAT. We reserve the right to cancel your contract if unforeseen circumstances arise, you will be notified.